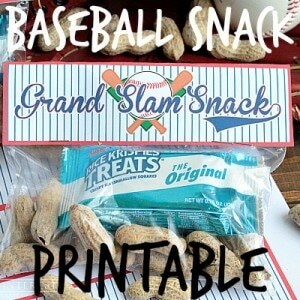 Grand Slam Baseball Snack - Home. Made. Interest. Batter up! 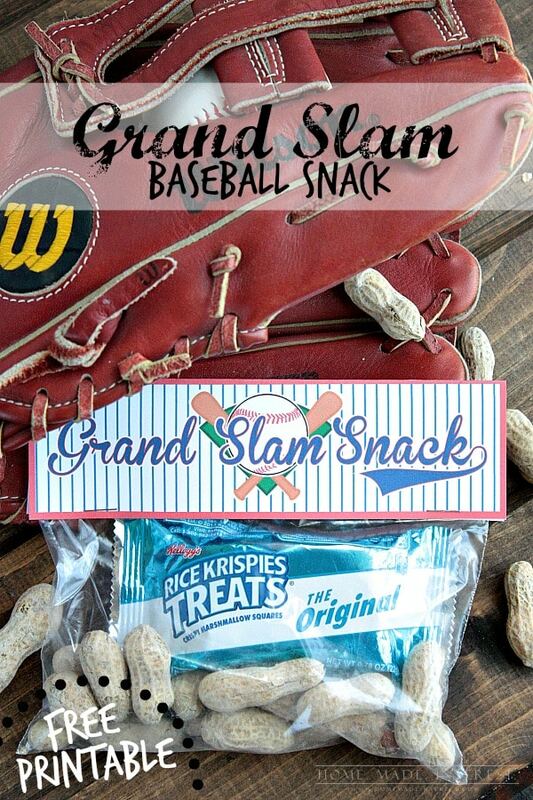 This Grand Slam Baseball Snack will give the kids a boost during the 7th inning stretch! 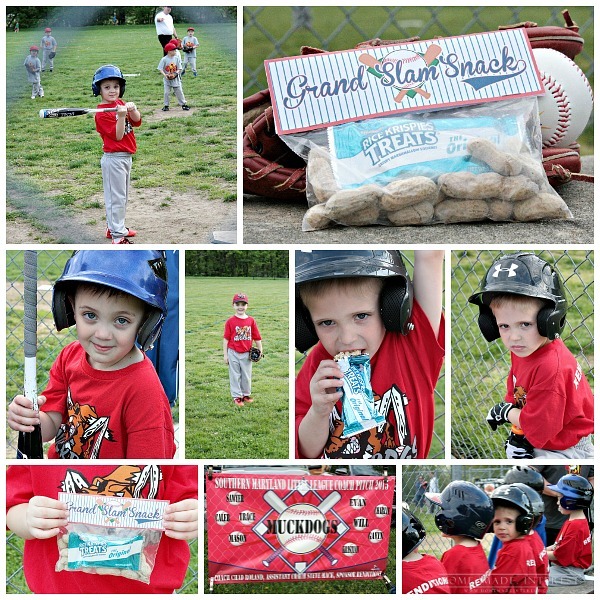 Yup, you read that right, baseball snack…not only is my son playing soccer again this year he is also playing baseball for the first time. Last week I was on snack duty and I partnered up with Kellogg’s® to save some time and #GetKreative with some Rice Krispies Treats® . Who doesn’t love Rice Krispies Treats®? Sure you can make them yourself but like I said we’ve got a lot going on these days so I used packaged Rice Krispies Treats®. They made a perfect addition. Packaged Rice Krispies Treats® make life super easy…not to mention they are delicious! For my snack I packaged them in a plastic sandwich baggie along with peanuts still in the shell (I had already checked to make sure there wasn’t anyone with nut allergies on the team). I added a foldover baseball printable to the top with a couple of staples (DOWNLOAD HERE). The kids tore into them. They liked the peanuts but they were most excited about the Rice Krispies Treats®, and what didn’t get eaten was able to go back in the sealable plastic baggie for later in the game. It was the perfect little pick-me-up for the 7th inning stretch. 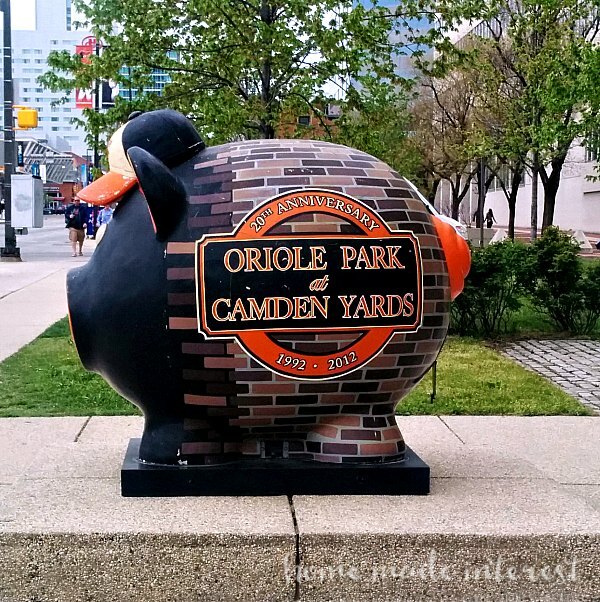 We live in Baltimore which means we are Orioles fans…and by extension Cal Ripken, Jr. fans. 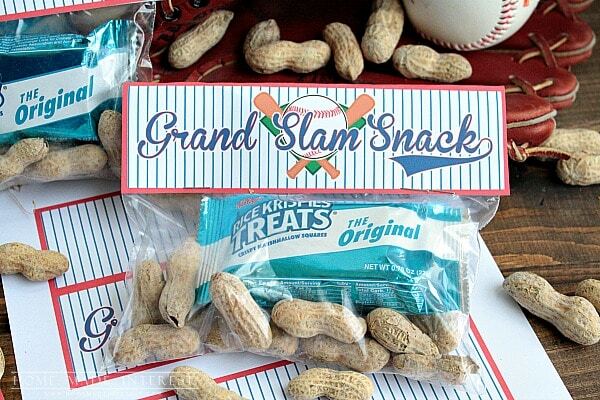 Right now Kellogg’s® Rice Krispies Treats®, Major League Baseball® and legendary shortstop Cal Ripken, Jr., are teaming up to help families unlock the fun this baseball season with their favorite snack. 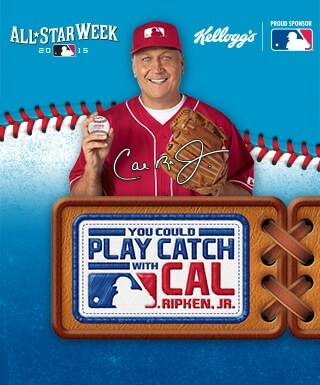 If you have some little baseball fans (or big baseball fans) in your house you can go out and pick up a box of specially-marked Rice Krispies Treats through July 1, 2015, and enter the promotion code at KFR.com/CatchWithCal for a chance to play catch with Cal Ripken, Jr., during the 2015 MLB All-Star Week!! This is my son’s last year to be with his best friend from preschool before they both head off to elementary school next year and it’s been totally worth the extra running around we have to do during the week. The boys are having so much fun playing together and we are having so much fun watching them. Just look at those future ball players! 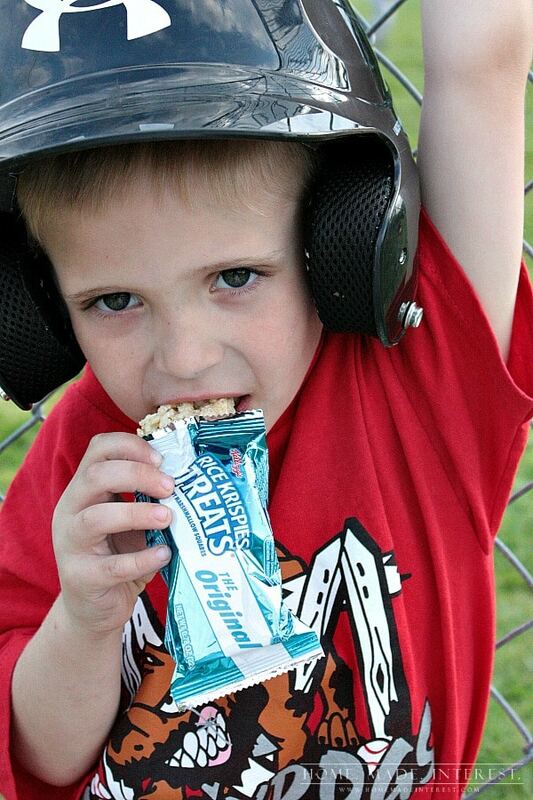 Alright now you’ve seen my baseball snack idea, how do you like to #GetKreative with Rice Krispies Treats®? 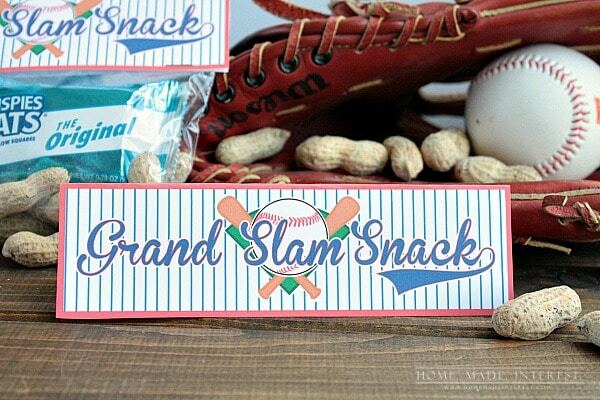 My boys are playing baseball this year, too, and I love this idea for when I am on snack duty! Thanks for the printable! This is such a cute idea – I love it! Thank you for sharing and linking up again at the Thank Goodness It’s Thursday link party! Love it! Such a cute snack pack. Thanks for sharing on Friday Favorites. Hope to see you link up this week. I also pinned your post! I did so many snacks when my kids were younger…I wish I had thought to do something this cute! Thanks for sharing with the Thursday Blog Hop! Such an adorable idea! Thanks for sharing your crafty inspiration on this week’s Monday Funday Party!